Big Rock Waste Disposal 2008 Ltd.: AB’s Cleanest Portable Toilets! From Rocky Mountain House, Big Rock Waste Disposal 2008 Ltd. offers portable toilet, garbage bin rentals, and portable office rentals across Central Alberta. As a family-owned business, we take considerable pride in having the cleanest portable toilets as we uphold to the highest hygienic standards. 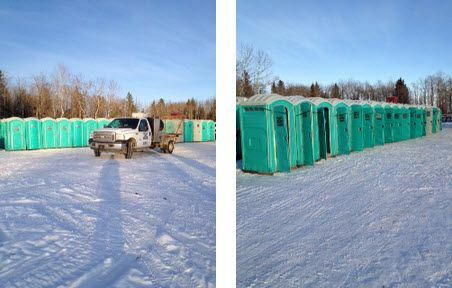 Our portable toilets and garbage bins are perfect for oilfield services and well-sites, concerts, government projects, and special events of all kinds such as weddings, graduations, company parties & events, and more. We have been trusted by organizations such as the RCMP, Alberta Forestry, and numerous oil & gas, construction, and mining-related companies to provide our garbage bin, porta-potty, and office rentals so you know we are up to the job. With our year-round service, we will deliver, set up and pick up your portable toilet, garbage bin, or portable office rentals. Following each pickup, our crew pressure washes each garbage bin and meticulously sanitizes every portable toilet, while also ensuring office trailers are cleaned thoroughly.